THE LOVELL-LARAMY HOUSE. Text and photos by Pam VanderPloeg copyright 2015. The Lovell-Laramy house, 1958, was designed for Mary Laramy and Ida Lovell by E. John Knapp and built by Lovell’s brother Paul. Current owners VIcky and Bruce became the second owners after they purchased it from Mary Laramy. This mid-century home is furnished with a mix of antiques and eclectic furnishings. It has gracefully survived what my friend calls “re-muddling.” The structural and design details are intact and cherished by the current owners. As with many modern homes, the street side masks the full impact of the architect’s vision – the lovely transparent feeling of the floor to ceiling windows in the main living area. On one side of the house larger windows are visible but a sense of privacy is retained. When I stopped by the first time, it was just on a feeling that the owners might be there. Bruce was in the driveway and the open garage door gave me a glimpse of his beautiful hand-built canoe nearing completion. Although I had given them no advance warning, they graciously invited me in to see their home. I was absolutely thrilled to discover how lovely this home is inside and out. The changes Bruce and Vicky made have increased the home’s livability such as a third bedroom in the basement. They enhanced the openness of the living area by removing what I understand was a sort of small partition wall/storage unit. Other changes were inevitable like new flooring in certain areas of the house and for safety a new stair railing shown below. You enter at the street level and leave your shoes beneath the bench Japanese style before entering up the stairs with their colorful slate finish. At the top is one of Knapp’s trademark built-in units, this one for books. During his student days, Knapp attended a Detroit Institute of Arts exhibit with a replica of a Japanese living room. Knapp shared his enthusiasm with his professor who loaned him a book on Japanese design which greatly influenced his later work along with the works of Frank Lloyd Wright. The second visit was arranged when architect E. John Knapp’s daughter Marcia was visiting from Missouri. On this pre-arranged visit, Bruce and Vicky brought out the architect’s plans and drawings that came with the house. When Knapp had completed his first preliminary sketches, he asked the two women to meet him on the site so he could show them the location of the house on the lot and the views from different parts of the house. Knapp recalled that he brought a large stepladder to the site and set it where the top step matched the floor of the main living area. Ina Lovell was the Assistant Superintendent of Elementary Education for the GR public schools. He had her go up the ladder first because he felt she was sensitive to the atmosphere he was aiming for. According to Marcia Knapp Krech, Laramy was the principal of Stocking Elementary School. "She caught on that Dad was teaching them about their new house. From the ladder they could see in all three directions. Their first reaction was how beautiful the views were including the mowed lawn of the golf course with all the trees they had planted." That golf course is gone now but at that time, 1957 about, they made the decision to put windows on 3 sides to take advantage of the view. Lovell and Laramy wanted a window wall but they didn’t want to see the house next door so Knapp suggested using a cost-effective colored glass system that he had used in one of his church designs where colored plastic was sandwiched in between clear glass in the large windows that faced toward the neighboring house! Also when they were on the ladder they realized, they didn’t want the fireplace to block the view. Knapp put the chimney in the middle of the house with the fireplace part of an expansive brick wall. On the kitchen side they had a big brick grill which the current owners decommissioned after a particularly unsafe adventure with it involving a lot of smoke. The roof was held up by a center beam in the living room. Knapp described doing his own engineering for the beam so that no posts were needed in the center of the room. Although Knapp remembered that his plan had been to use 2 x 6 lumber for the beam, 20 footers glued & nailed together (20 ft. wasn’t long enough), the homeowners report that close inspection shows the beam to be constructed of 2 x 4 lumber. Knapp also recalled that they used nails to clamp them together because they didn’t have clamps that were big enough. After Lovell and Laramy lived in the house for 6 months, they called Knapp and told him they were havinga party at their house for teachers. They wanted him to come and give a talk about architecture, art, design, fabric. He described to the audience how he designed the house and the influence of Japanese design and Frank Lloyd Wright had on his work. The two bedrooms are cottage-like with post and beam ceiling and wood floors. New bamboo screens replaced the original wood folding doors on closets. Hallway flooring on the main level is the original cork and the laundry room has the original light fixture and built-in storage units. The bathroom’s original tiles and sink are framed as are other rooms in house with Frank lloyd Wright style piano hinged doors. The kitchen features the vaulted ceiling, original cabinets and door pulls. It is evident that the owners treasure their beautiful home. They did not approach the home as mid-century modern enthusiasts. However, as many others have done, they fell in love with the house immediately and made it their own. They have maximized the site by retaining some original plantings, creating new gardens and restoring an original overgrown water feature. Here Bruce and Vicky pose with Marcia as we wandered through the large yard with its flower and vegetable gardens, pergola and pleasant seating areas where resident chickens wander. Rarely do you have the chance to tour a house so beautifully preserved in the context of the stories of the home’s beginnings. We thank Bruce and Vicky for welcoming us into their home. And we thank Knapp for sharing his memories of the design process. And one last fun detail. 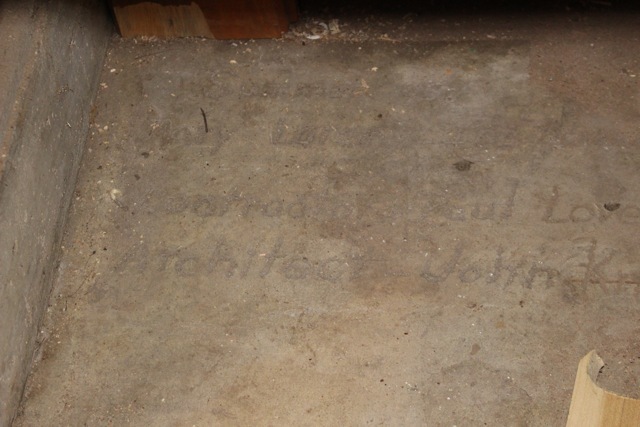 Bruce showed us the corner of the garage where just barely visible are the names the owner, architect and builder etched in concrete so that this information would never be forgotten.